It was just one of those beautiful fall days so I decided to dress up in one of my favorite combinations: plaid and leather. The combination is both whimsical and chic and can we just talk about this leather skirt? I've never seen a leather skirt with scallop edges! I've been trying to stop buying dresses and skirts since winter is coming but I just couldn't resist this one. I could totally see myself wearing this in the summer too with a t-shirt and flats for a casual look. 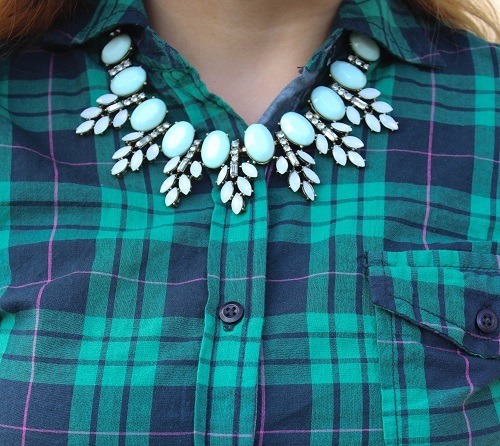 The star of this outfit is of course the mint green necklace that I'm wearing from the Happiness Boutique. 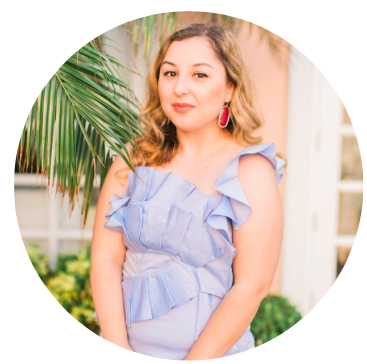 A great statement necklace always enhances any outfit and I've already worn this one three times this week! From t-shirt and jeans to more fancy outfits like this one, it just goes with everything and is so lightweight. They have so many other great pieces as well so I highly recommend checking out the boutique if you're looking for some new jewelry! Such a fun fall outfit!! So cute on you. 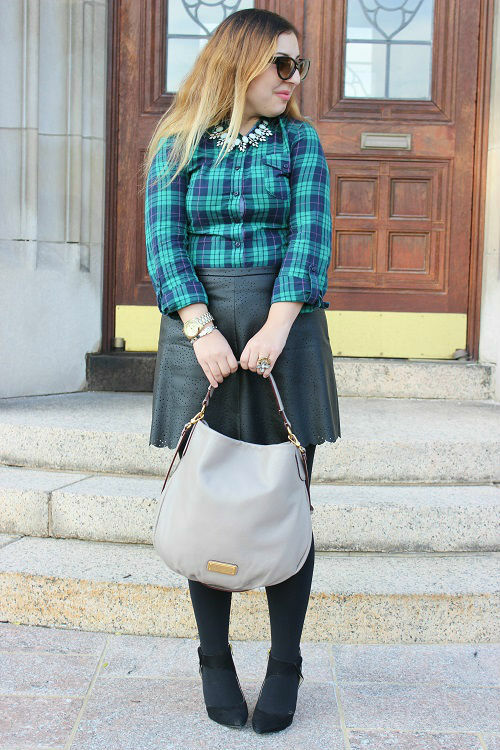 Love the plaid shirt paired with a fun skirt + necklace! Everything about this outfit is PERFECT for fall, I love it! Cute outfit. I love the necklace! Your skirt and necklace are on point! Love this outfit! Perfect for cold weather! I love your style, this look is adorable!